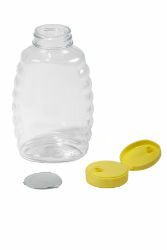 Made of BPA-free PETE plastic, this Skep-Style honey jar is squeezable. Space is provided on the bottle for Little Giant® honey labels (sold separately). Yellow flip-top lids with built-in freshness and safety seal are included.